Flower stencil Lotus. Beautiful floral stencils for DIY wall decor. Large flower stencil Lotus Grande creates quite a statement in a room! Try this dramatic floral stencil for your next DIY decorating project. Super easy to use! Great for beginner stencilers and professionals alike. Comes in 3 sizes, choose the one that will work for your stenciling project. These are Reusable wall stencils, not vinyl wall decals. • Our Sturdy and Reusable stencils can be used again and again. One stencil can produce many images unlike one-time use vinyl decals. • You are not limited with your color choices. Choose any paint color you want to perfectly match your decor. • Stencils will never damage your walls. No peeling, no glue residue, no worries. • Unlike decals, stenciling is easy to touch-up, adjust or re-do. With most decals you only get one chance to install it right. • No artistic ability is needed to use a stencil. Plus you get the satisfaction of producing beautiful wall art. Even beginners get great results! • Super economical! Stenciling is more cost effective than wallpaper, decals or faux finishes. • Works on textured walls, floors, ceilings, furniture and fabric (see below for more detailed info). • Custom sizes are available on request. • Detailed illustrated Stenciling Instructions included. If you compare our stencil thickness, size, design quality and prices to other stencil companies, you will be amazed at the great value that Cutting Edge Stencils offer! Got textured walls? No problem! If your walls have a light/medium texture, they are quite suitable for stenciling. With textured wall it is better to use a stencil brush. It's especially important that you put very little paint on your brush, always off-load it on a paper towel, and use rubbing/dabbing motion while stenciling. 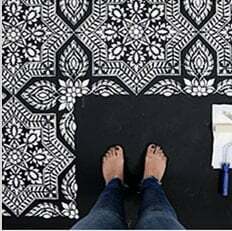 Using a spray adhesive also helps a lot to prevent any seepage of paint under the stencils. But again, you'll not get any seepage with textured walls if you use very little paint on your brush. If you try using a foam roller, definitely use spray adhesive, ( we love Elmer's) use very little paint and don't press hard on the roller to avoid seepage.